Once the decision to build a church of their own, on the lot at the corner of Audubon and Runnymede avenues, had been made by the small group of Methodist families living in Wayne in the early 90’s, two committees became very active. One was the Finance Committee and the other was the Lot and Building Committee. The first named had to set up a system for providing for the current expenses of Church services even at the early period when these services were still held in the school building. The last named had to make plans for the building of the church and the financing of that building. However the Board of Trustees finally faced the fact that at least $21,000 would be required to finance the building and furnishing of the new church. Definite plans were completed after a loan of $10,000 had been obtained from the Philadelphia Savings Fund Society, and plans had been made for security pledges for the building fund from members of the church. Separate contracts for various portions of the work were awarded and Thomas Goreham, of Rosemont, was appointed superintendent of the building operations. Ground for the new church edifice was broken on September 30, 1890, the cornerstone was laid on November 21, and the dedication services were held on July 28, 1891. The now defunct Public Ledger of November 22, 1890, reported that “the exercises connected with the laying of the cornerstone of the Wayne M.E. Church, on the line of the Pennsylvania Railroad, attracted a large number of persons from Philadelphia, Berwyn, Bryn Mawr and other places. “The occasion was also graced by the presence of the Rev. Thomas L. Bowman, of St. Louis, the Senior Bishop of the church, and the resident Bishop, Rev. Cyrus D. Foss, of Philadelphia.” In addition to various other Methodist Church dignitaries, others in attendance included the Rev. W.A. Patton, of the Wayne Presbyterian Church; the Rev. R.D. Naylor, of St. Luke’s Church of Bryn Mawr; the Rev. John W. Miller, of Radnor Baptist Church, and the Rev. C.W. Strom, of Berwyn. And this is to mention only a few of the many present for the occasion. And so it was that the Rev. Bickley, the “earnest young pastor” was in the pulpit of the new Methodist Church when it was dedicated with much ceremony and before a large congregation of members, friends and visiting church dignitaries, on June 28, 1891. Note: Helen Sentman Harris (Mrs. Henry Harris) has telephoned your columnist from Media that her father’s name was Wesley G. Sentman, not Walter G. Sentman, as given in the first article of this series when the names were given of the four original Methodist families to come to Wayne in the late 80’s. While Mrs. Patterson regrets the innaccuracy, the mistake itself goes back to an error in the old Minute Book of the Wayne Methodist Church. Up to the time of the ”delightful Sabbath afternoon in March” when in an informal way quite a number of the Methodist families met at the corner of Audubon and Runnymede avenues to discuss and examine a proposed new church site” all of the other three building locations under consideration had been in North Wayne. This change of base is interestingly explained by William Post in the “history” which prefaces the Minute Book proper. As a result of this visit, Mr. Smith promised to have an early consultation with George W. Childs and report the outcome to the interested Methodists. In the brief interval between the choice of the site of the church property and the date on which Mr. Child’s favorable answer had been received, definite steps had been taken towards the organization of a Methodist Society in Wayne. “On an evening in early April”, according to Mr. Post’s history, “Mr. and Mrs. R.C. 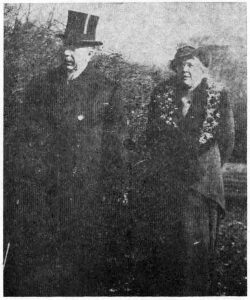 Ware kindly opened their home to the Wayne Methodists and while all could not be present, the following responded to the invitation, namely: Mr. and Mrs. James P.P. Brown. Miss Mary A. Brown, Mr. Joseph Williamson, Mr. and Mrs. A.M. Ware and Mr. and Mrs. William Post. And with the written account of this meeting at Mr. & Mrs. R.C. Ware’s house, Mr. Post’s concise and interesting “history” in the forepart of the old Minute Book comes to an end, and the “Minute Record begins. At this time the formal choice of name as the Wayne Methodist Episcopal Church was made. Under the guidance of James P.P. Brown as Class Leader, properly attested certificates were now presented by those who had been instrumental in starting the Methodist movement in Wayne. Nine trustees, including Homer J. Hoey, Frank W. Carr, Joseph P.P. Brown, Ralston C. Ware, Arthur M. Ware, William Post, David Brown, Charles D. Smedley and James B. Carr, were elected. An offer from the Radnor Township School Board of one of the class rooms for a place of temporary worship was accepted. And announcement was made that Pastor Reverend Edwin M. Pickop would come to fill the pulpit for the summer. The picture illustrating today’s column is a treasured old one of Mr. and Mrs. A.M. Ware, as they were about to leave their home on West Wayne avenue to attend church services. It has been lent to your columnist by the son and daughter of this early Wayne couple, Albert A. Ware and Mrs. Gertrude Ware Case. Its exact date is not available, but it was probably taken in the 1890’s, as indicated by the clothes worn by the couple. The A.M. Ware home is the one at 116 West Wayne avenue, from which Dr. H. Lee Scott and his family recently moved. In the distant background of the picture the old Wayne Lyceum, later called the Wayne Opera House, and now known as the Colonial Building, is plainly to be seen. The picture of the Wayne Methodist Episcopal Church used to illustrate this week’s column is a very recent one, lent to your columnist by Albert Ware. But except for the ivy which covers its stone walls and the larger trees which now surround it, the church looks very much as it did after it was built in the closing years of the 19th century. Although the plot of ground on which it originally stood has been added to, the building itself has not seen any additions or structural changes. The “Wayne News” carried a very complete story of the dedication, held on Sunday, June 28, 1891. The building itself is described as “of Gothic architecture with pointed window and door arches, mullioned and tracery window frames, which are filled with ornamental tinted glass in lead band frames. The walls are built of light gray stone from Christopher Fallon’s quarry, cement pointed and trimmed with Indiana limestone. The building and tower have angle buttresses and broad entrance steps, adding strength and dignity to the appearance. So much for the church as it looked upon its completion In 1891, and as it still appears today. However, in the interval between the formal request upon the part of several Methodist families who had come to Wayne in the ’80’s and ’90’s, to the Wayne Estate “to set aside a suitable plot of ground for Methodist uses”, much had taken place. And apparently none of the group either among the newcomers or those who had already had the matter under consideration were entirely satisfied with the Poplar avenue site. Mr. Post’s history makes this point very clear. “A degree of unrest seemed to prevail at this time among the brethren as to the location of the lot set apart by the Estate for the Society. This led Mr. Joseph P.P. Brown and Mrs. A.M. Ware, after conference with the other brethren, to secure from Wendell and Smith the refusal of a lot at corner of Beechtree lane and Woodland avenue, and one at corner of Walnut and Woodland avenues. And then the Methodist group evidently saw the necessity of decisive action on their part for reasons given in Mr. Post’s history. He writes that “during this same year (1890), the town had had a marvelous growth. Houses were going up upon the hillsides everywhere and new and elegant Episcopal and Baptist Churches had been erected together with a dozen tasteful stores.” It was evidently high time for some decision on the part of local Methodists if they were not to be left in the vanguard of Wayne progress. And it was only a month later – March 1890 – that “again one delightful afternoon… in an informal way quite a number of the Methodist families met at the corner of Audubon and Runnymede avenue to discuss and examine a proposed new church site.” And for many reasons the decision on the eventual site for the new new church was a quick one. On Sunday, June 28, of this year, the Wayne Methodist Episcopal Church celebrated 62 years of worship in the church edifice located at the busy intersection of State Highway 252 with Bloomingdale avenue. 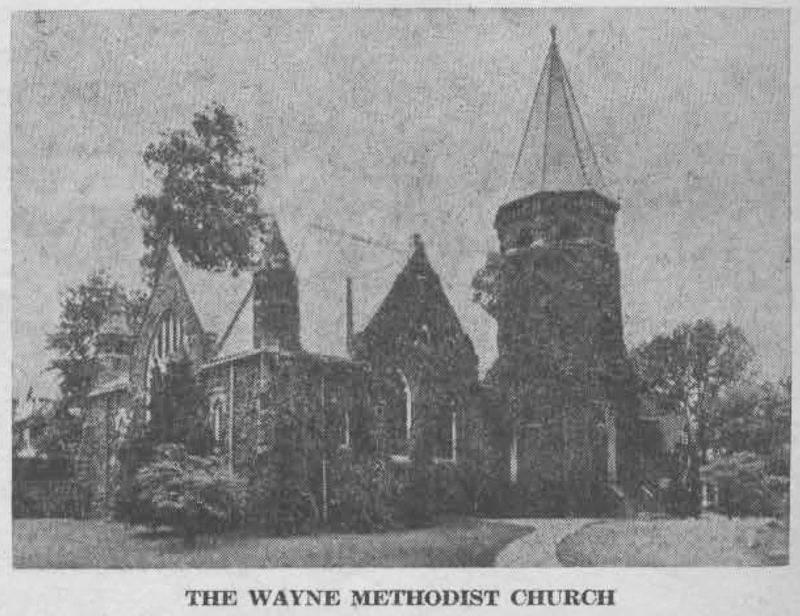 It was on Sunday, June 28, 1891, that the dedication services were held and the first sermon preached in the church, which had been erected through the efforts of a small group of Methodists who were recent arrivals in Wayne. The acre of ground on which it stood had been the gift of Drexel and Childs of the Wayne Estate, who in the middle of the 1880’s started the development of Wayne as we know it. Up to this time the Methodist Church was the fourth church to be erected in Wayne, antedated only by the Wayne Presbyterian Chapel and the Presbyterian Church on Lancaster Pike; the First Baptist Church, which up until two years ago stood on the southeast corner of Conestoga road and West Wayne avenue, and by St. Mary’s Church, on the southeast corner of Lancaster Pike and Louella avenue. The Presbyterian Chapel was built in 1870, a gift to its charter members by one of Wayne’s most distinguished citizens of that period, J. Henry Askin. The present church building was erected in 1890, replacing the first small building, which was originally known as Music Fund Hall. St. Mary’s Church was completed In 1889. Thus, within a two-year period, four large church buildings were erected in the small suburb of Wayne. Less than ten years before the Wayne Methodist Church was built, the land on which it stood was still part of the farm of Izzachi Fritz. lt was not until about the middle 1880’s that Audubon avenue was laid out, running south from Lancaster Pike and joining Conestoga road at the corner where Dr. Truxal’s house now stands. The part that extends a short distance past the church has recently been renamed South Wayne avenue, as has Summit avenue, which is its direct continuation south to Conestoga road. This stretch of road is also part of State Highway 252, all of which, from Lancaster avenue to Conestoga road, now is known as South Wayne avenue. It is interesting that the Wayne Methodist Church should stand not far from Conestoga road, since part of this one time narrow Indian trail was known as “Methodist Hill.” That was in the early days of the Radnor Methodist Church in Rosemont, the oldest Methodist Meeting House in Delaware County. Its one-story log cabin structure, built in 1783, was replaced by the present building in 1833. At various times some alterations and changes have been made in it in the 120 years of its existence. Amid its old graves it now stands in its quiet beauty and dignity, almost directly across from the Rosemont school, a center of Methodist activity for that entire vicinity. How the the present Methodist Church in Wayne came into existence is recorded in a foreword in the “Minute Record of the Board of Trustees and Corporation of the Wayne Methodist Episcopal Church” lent to your columnist by Albert Ware and his sister, Mrs. Gertrude Ware Case. Their parents, Mr. and Mrs. Arthur M. Ware, were among the four families named In the Minute book as “among the newcomers to purchase from Wendell and Treat all of them Methodist families from Philadelphia and pioneers for our denomination in Wayne.” The other three were Mr. and Mrs. Walter G. Sentman, Mr. and Mrs. Homer J. Hoey and Mr. and Mrs. Joseph Williamson. “About the year 1881, the Wayne Estate, composed of George W. Childs, A.J. Drexel and the heirs of Francis Drexel, determined to develop and bring into the market a large plot of ground (in all about 600 acres) in and around Wayne, Delaware County. The town program at this time contained one large general store, one summer hotel, about 20 dwellings and a Baptist and a Presbyterian church, the latter a gift complete from J. Henry Askin, Esq., whose mansion adjoined the church property, and from whom a large part had been purchased. Among the purchases of the new Wayne houses were the seven Methodist families already named. “About a year later”, writes Mr. Post, “came David Brown and hls wife and Miss Mary A. Brown, also Methodists, from Philadelphia. In the next three years no accessions were made to their small colony although extensive additions had come to the town in all material aspects. However, in the spring of ’89 this Methodist contingent was further re-inforced by Joseph P.P. Brown and family, Frank W. Carr and family, A. M. Bosse and family, and Dr. Charles D. Smedley. These new accessions gave occasion for frequent converse among the Methodists, both on the train and in their homes, relative to the formation of a church organization. The rapid program of plans toward the erection of the church as completed in 1891 will be told in next week’s installment of this column. In writing this series of articles during the last few years your columnist has several times referred to the “Sentinel Chestnut”, on Old Eagle School road in Strafford. Up until the time that the Strafford Pharmacy was built on the northeast corner of this old road and Lancaster Pike, the tree stood on the ground just back of it. 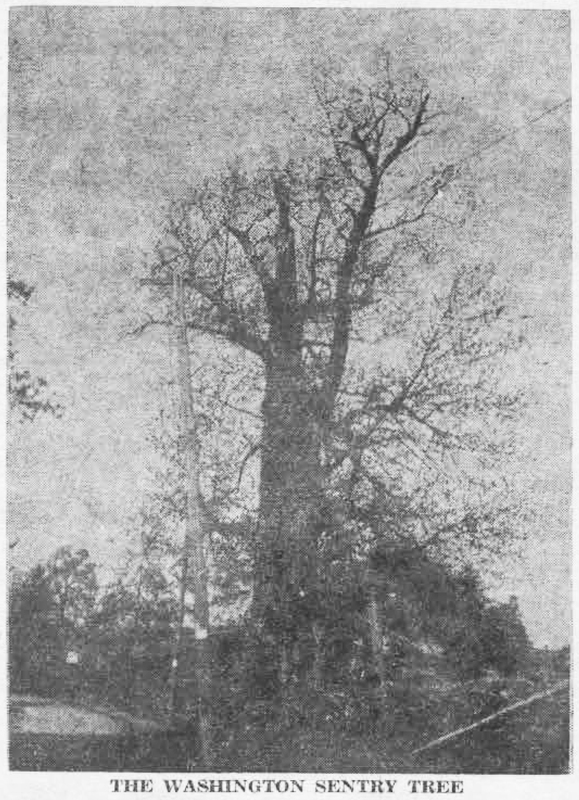 It was one of the series of tall, sturdy trees that stood at intervals between the Old Spread Eagle Inn and Washington’s headquarters, along which messages were relayed. When the picture of this tree was first used in this column last January, the statement was made in the accompanying text that “when the big chestnut… was taken down to make room for the drug store, it was rescued from burning by a Mr. Barr of Phoenixville, who still has much of it stored in his barn.” Mr. Barr proves to be none other than Morris Abner Barr, about whom we have been writing these past few weeks, and there has come additional information in regard to this famous old tree. It seems that among the thousands of visitors who stopped to examine the displays in Mr. Barr’s Museum, near Valley Forge, there was a young Englishman, who remarked casually that Mr. Barr should add a piece of the Washington sentry chestnut to his collection. This man referred Mr. Barr to the wife of the sheriff of Chester County, who, it seems, knew the history of the tree. She, in turn, sent Mr. Barr to the owner of the property on Old Eagle School road, on which the tree had stood for probably some 300 years or more. By this time however, it had been felled in order to make room for the stores about to be built along the Pike, and had Mr. Barr arrived on the scene even a day later than he did, his mission would have been in vain. For in order to dispose of the tree quickly, the owner was about to let the fire, which was already burning the underbrush, take its toll of the great trunk and heavy branches which were lying on the ground. A picture made on the day of Mr. Barr’s arrival on the scene shows the haze of smoke hovering over the scene. Once in his possession, Mr. Barr began to make plans for the distribution of pieces of the old tree. Some of the wood was rotten, as the tree had been killed by the San Jose scale several years before it was cut down. However, the major portion of it was still sound, including even the sentry box near the top. It is said that the next sentry tree to the north was one on the present property of the Doyle Nurseries. That there may have still been others in this series of trees to the south of the pike is indicated in some interesting correspondence between Mr. Barr and Henry Pleasants Jr., son of the author of the books on the history of Old Eagle School and on Old St. David’s Church. Under date of June 15, 1940, Dr. Pleasants, who was then vice-president of the Chester County Historical Society, wrote to Mr. Barr: “I am extremely interested in the George Washington tree souvenirs, concerning which you so kindly wrote me. I remember the tree very accurately, as it was still standing when I was about ten years old… When my father wrote his books on the Old Eagle School and on Old St. David’s Church, he used a photograph of this tree as an illustration. On the day of the 18th Annual Pennsylvania State Sunday celebration held in January, 1941, in Washington Memorial Chapel, Valley Forge, Mr. Barr was chosen to make a personal presentation of a piece of wood from the George Washington tree. Schools, colleges, historical societies, churches and individuals throughout the entire United States have bits of the tree. Even as far as the Island St. John, Newfoundland, there is an Episcopalian church in which the rostrum is made from some of the wood of this Revolutionary relic. And as close as our neighboring community in Manoa, Delaware County, the Presbyterian Church has a flag pole made from the wood of the tree. And this is to name but a very few of the repositories of the bits of the last of the Washington sentry trees.